adding a touch of sophistication to your home. or in bedroom, bathroom, kitchen, garage, storage room, etc. 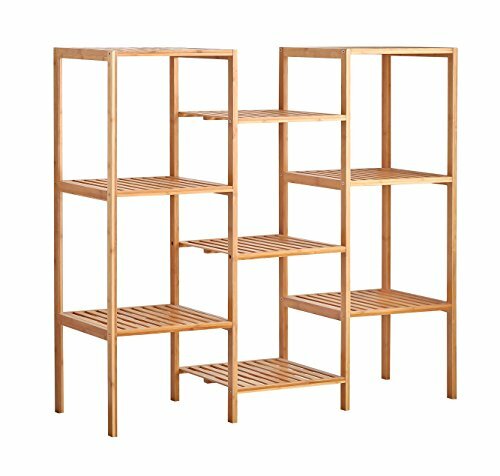 DIY Storage Rack: You can get a 9 tiers linked shelf in two different way or get two separated bamboo storage rack, but check the holes in the legs carefully. Enjoy your "woodworking". Stronger Storage Rack: By add an extra supportive rib, the weight capability can be up to 30LBS on each layer. Considerate design : Even though, we craft this rack as strong and lightweight as we can, and offering larger anti-slip pads on the bottom of each leg, we still suggest you put this rack against the wall, for you and your family's safety, and keep away from child. Approximate size: 38 x 13 x 35.37 inches(96.5 x 33 x 89.84 cm).